Explains the logic of the script. For example, if data is returned in a particular format, and it needs grooming prior to use, explain that logic in a comment. This includes business rule logic. Enable predictable changes in the future. If you understand the logic requirements when the script was created, you will more easily understand changes needed when those logic requirements change. Simplify troubleshooting in the future. Again, understanding the logic let’s a human more easily find faults in the logic and fix them. Adding a single line comment in PowerShell is easy. Begin the line with #, followed by your comment text. In PowerShell ISE, it will be color highlighted as green. # This is a single line comment. # This is another single line comment. # This is another single line comment. # Business Logic Rule # This particular function is derived from our company Policy and Procedure number # 24, section 2. All user accounts that have not logged in to a computer within # 90 days should be disabled automatically, and an email alert sent to the head of IT # Security informing them of the action taken. # Security informing them of the action taken. It is readable, but it could be optimized. Also, if you have a bunch of comments like these, that is a lot of extra scrolling you have to do. Both readability and scrolling bloat can be addressed with a multi-line comment. 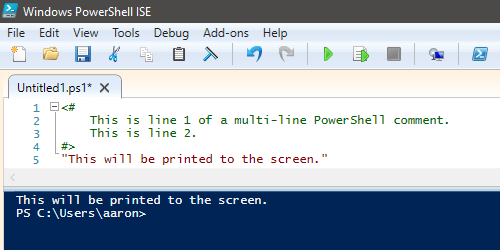 Adding a multi-line comment in PowerShell is almost as easy. This time, two tags are required, an opening comment tag, <#, and a closing comment tag, #>. It will be color highlighted as green too. Security informing them of the action taken. You can also collapse the multi-line comment for easier reading, expanding it only when needed. Do not add a comment to explain basic PowerShell knowledge a likely reviewer would already know. A comment should explain the logic being implemented, especially if it is unique or related to a business rule. Comments should be as close as possible to the code they describe. Avoid complex formatting of comments. The more formatting rules you try to enforce, the less likely they are to be adhered to and may discourage commenting overall. Don’t include redundant information. For example, if you are checking your code into a version control system, the script itself doesn’t need a revision history. Document in code first, and comment last. For example, use descriptive variable and function names to help a reader understand the parts in play. Now that you know the basics of commenting, make a dedicated effort to incorporate to your daily coding practices. You will be glad you did when you revisit that code in a year!